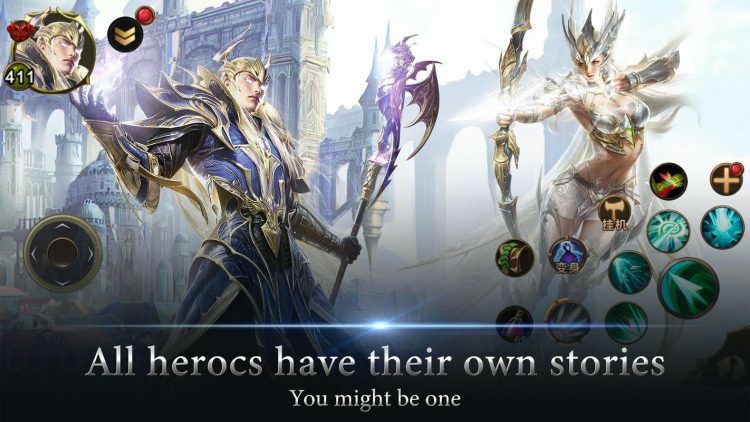 Everlasting Lineage is one of the latest MMORPG from HIGAME developed for the Android and iOS platforms. It boasts great graphics and animation effects that look great even on mobile. Playing Everlasting Lineage on PC is just as enjoyable. And, the story behind it will take you on an epic journey filled with adventure. Events of a prophecy are unfolding. It was foretold that dark energy would seep into Aden City through a Dimension Crack. This woke up powerful primitive races that want to enslave the world. The prophecy also mentioned the arrival of a warrior who would shoulder a great mission. Play the game to find whether you are the chosen savior who will slay monsters and vanquish menancing bosses. As you travel through the 3D magical world in Everlasting Lineage, there are endless quests to accomplish. You will meet many protectors of the land fighting the war. These non-player characters will send you on errands and missions to prove yourself. Your mission may be to deliver an item, rescue people, get information or kill goblins, demons, dragons, water spirits, and all kinds of monsters. Other times you will be sent to collect valuable items for reinforcing seals that keep monsters at bay, making spells or opening portals. After showing great potential, your mentors and trainers start to strongly believe you are the special hero foretold in the prophecy. The missions progressively get tougher as your CP (character power) increases. There are three main character types when playing Everlasting Lineage on PC. Rangers have fast ATK speed and strong flexibility. They are good at getting out of danger. Swordsmen are natural superior fighters. Their extraordinary strength makes them extremely suitable to battle tough enemies. On the other hand, Prophets hold strong ice thunder power and can cause a wide range of damage to enemies. At the beginning of the game, you can select your character type and choose any gender. Customization features don’t end there. There are wings and plenty of fashionable costumes to equip, which will become available as you level up. You can upgrade your weapons after collecting enough refine stones. Open ‘Forge’, select equipment on the right and tap refine. The weapon’s ATK will increase when refined. Enhancing skills will allow your fighter to deal more damage. The higher your DMG percentage, the faster the enemies will fall. To enhance skill power, visit the ‘Skill’ tab from your ‘Character’ menu and tap ‘upgrade’. A big part of Everlasting Lineage involves working with non-player characters to defend the magical world. You will hold lots of dialogs with thes characters throughout the game. Although you can skip the conversations, it is best to read them. By doing so, you will be following the story, which is what makes this RPG interesting to play. As you complete quests and level up, new weapons will become available. Make sure to try out new gear. This can improve your warrior’s performance in battle. Every character can mount a pet in the game. Pets can be anything from a tiger to a dragon. Take advantage of the pet mounting feature after unlocking it. Mounting makes it easier to move across the virtual world quickly. Go to the search box in Bluestacks and type “Everlasting Lineage” without the quotes, of course. That is it! You can now enjoy your freshly installed copy of “Everlasting Lineage” on your favorite PC!